With Return Ticket – The story of South Wales Transport safely with the printers, the team at Bryngold Books is now fully-focusing on plans for the launch of what is without doubt the best ever compilation of words and pictures about this legendary bus company. The event will take place at the Waterfront Museum, Swansea at 2pm on Saturday, May 17. Anyone who has ever had an interest in the company as a member of staff, passenger or simply a bus enthusiast is warmly invited to come along and savour the occasion. Plans are now well underway for the launch event of our upcoming new title Return Ticket – the Story of South Wales Transport. The wraps are all set to come off the book at a special launch being held as part of the prestigious Wales on Wheels event at Swansea Waterfront Museum at 2pm on Saturday, May 17th. The first books will be released for sale immediately after. This really is a fantastic, lavishly illustrated full colour book that no-one with an interest in South Wales Transport or buses in Swansea and the surrounding towns will want to be without. There’s no doubt that the book will be a fitting tribute to the company in the 100th year since it was formed. If you’re interested please come along to the launch. Bring your friends too and spread the word on not just our event, but Wales on Wheels too. 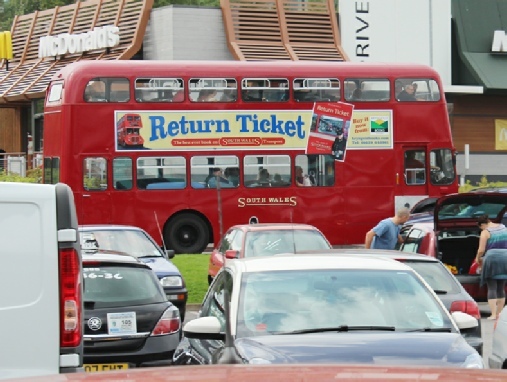 Swansea Bus Museum plans to have a selection of its buses on display too, including some of those featured in the book. Watch out for further details. You can order the book in advance on our books page.